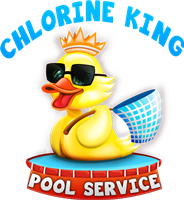 The Pool Pump Affinity Law - Chlorine King Pool Service - Seminole, FL. This is where all of the magic happens! The reason for the savings is because you reduce the motor speed. Even though you also reduce the flow rate you're still cutting the power consumption drastically. The charts above depict just that! 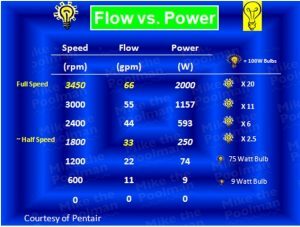 The pump affinity law for pool pumps shows how all of this is possible between the 3 main components; (1) motor speed, (2) flow rates and (3) energy consumption. 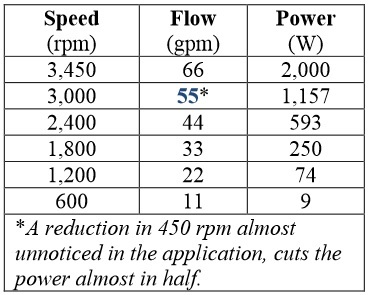 Most of the savings is from the reduction of the speed of the motor (RPM's) even though some of it is contributed to how efficient a permanent magnet motor is. One would think that if you cut the speed in half, you also cut the power in half. However, you would be terribly mistaken. According to the law, what actually happens is if you cut the power (speed) by half, you also cut the flow by half but that's where the similarities end. The power consumption drops at a different rate (nonlinear) than the other two. In this example you actually reduce the power so drastically you're only using about 1/8 of the original power you used with the single speed after cutting the speed in half. How awesome is that! You can see with the chart above the slower you run the motor you exponentially lower the power consumption. Again, this equals MONEY for you! Essentially this all means a huge savings for you. In order to do so you need to install a pump like the Pentair, IntelliFlo variable speed pool pump. Then you can dial in your pump at a much lower speed and running it longer to get the required turn over. You'll then enjoy a savings and quieter equipment pad than every before. Sounds like bliss right? Yea I thought so too! Below you'll see the pump that started it all. If this is confusing to you please don't hesitate to contact us and we'll be happy to help!